SAP has created a Partner Sales Academy to produce a new set of sales professionals with selling skills designed specifically to increase coverage and success in the General Business (GB) space. These sales executives will provide an outstanding customer experience to their prospects, helping companies through their digital transformation, engaging with CxOs, leveraging Digital Sales Motions, and driving the sales cycle end to end, fully aligned with SAP sales methodologies. The idea behind this program is to bring more sales people into the SAP partner environment and ideally people are new to sales. We are looking for candidates who have no or limited sales experience who may come direct from business schools or are in other roles where they are looking for a change into sales. This is not a training course for people who have been selling SAP for an extended period of time as we are looking for new, fresh candidates who will help us grow the number of sales executives in the SAP ecosystem. After a pilot in Australia that is taking place in November and December 2016, SAP will be rolling this program out globally. We have plans to run the partner academy in EMEA, North America, MEE, Latin America and China so if you are interested in sending anyone to this program or would like to get more information, please feel free to put your comments in the forum and I will contact you to discuss the roll-out in more detail. I would also welcome any comments about what else you would like to see in this program as we take it to all the global regions. The screenshot below is the latest planned global rollout of this program. All of the dates in here are still to be 100% validated but these are the planned dates for each region. As soon as each region is confirmed I will add the invites and registration page on this site. Whar are the costs for this sales curriculum? for the pilot in each region, there will be no cost to partner. once we have these completed and we roll the program out further there will be a cost of €1500 per participant. Do you already have a timing for this 6 weeks program? 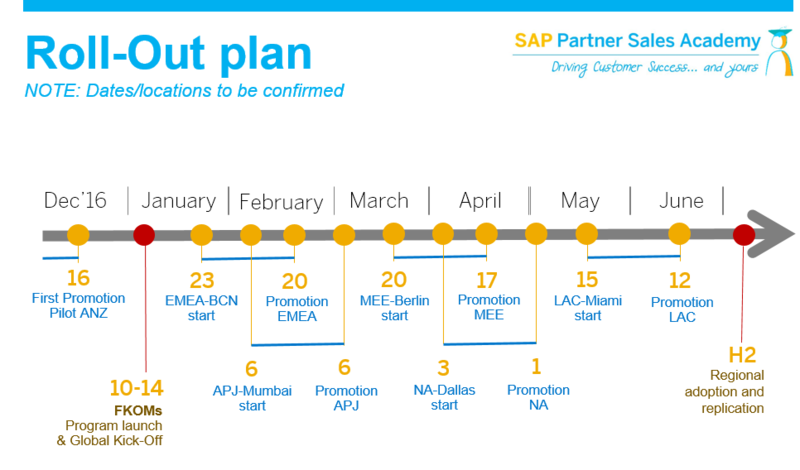 Looking forward to updates on the SAP Partner Sales Academy! Interested in learning more about this program as it progresses for the US partners. Interested – will stay tuned for updates. Waiting for something like this to happen in INDIA(Bangalore) on Pre-sales. When session planned for Saudi Arabia ? We are waiting for details. Keep me posted for Turkey. We are interested in this program in 2017. Let us know schedule for North America and India. Are all costs including travel and accommodation catered for? and how can one register? Josphat – the partner will have to cover the costs for travel and accommodation. SAP will pay for the trainers, room hire, catering etc. Hi Philip, how are you? Is there already a planned date to have this program available in Brazil? Let me know when it is available in Brasil. We would like to send somebody to LAC Miami, thanks in advance. We are very interested and looking forward for dates in Mexico. We are VAR Partner for SAP in India, MENA and Africa – Please help us to register for it and i think its free for VAR Partner right ? Please send me the information regarding EMEA program. We are VAR Partner for SAP in India. Please help us to register for it and i think its free for VAR Partner right ? I am Interested too. But I can not see any tool or buttons to add my self the program. How can I enroll the program ? Also is this progrom cover the Business One partners or not ? is this program available for Partners in China too? Hello, how about Partner in Malaysia? We are interested, thank you. Is this available for SAP Employees? I am interested in this program in EMEA. Is it too late? When is the next session planned? Hi Phillip, how are you? I am working as a SAP Hybris Consultant in UK (SAP Hybris Gold partner) and very keen to transition towards Sales and Presales. 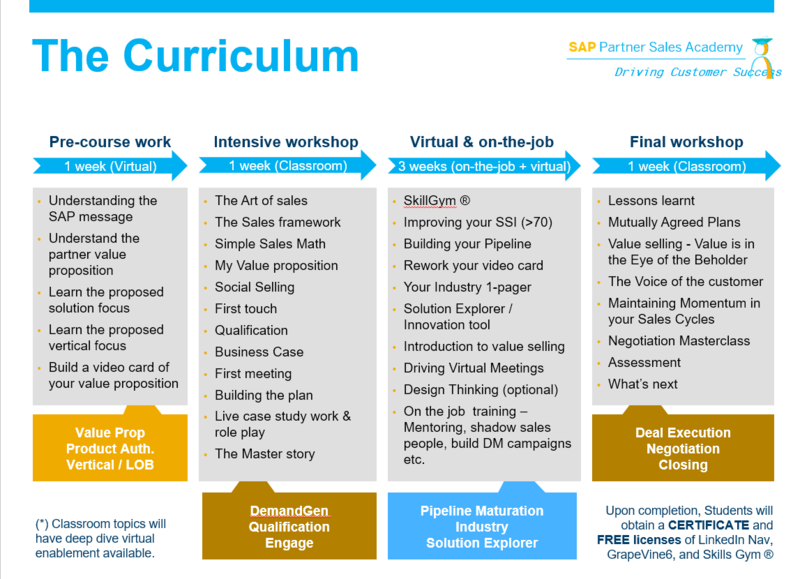 SAP Partner Sales academy seems very interesting to me. How can I get enrolled in the program, and when are the dates being announced for the next run?